None of us want our little treasures we've purchased to pamper ourselves with to become a great, mushy mess! Proper care will make your hand made soap bar last much longer. 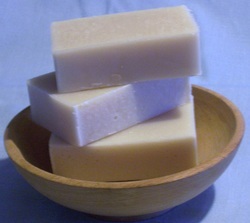 Hand made soap is a special product. Because it contains glycerin, it can retain more moisture than other soaps. To extend the life of your hand crafted soap, place it in a well-draining soap dish. Keep unused bars in a cool, dry place out of direct contact with water. A good soap is like a fine wine, the longer it cures, the harder, better and more mild it becomes. Our soaps will last approximately 3 - 4 weeks per single person use.